Unilever has agreed to sell its European frozen food business, including Birds Eye, to private equity firm Permira for 1.7bn euros (£1.15bn). The firm's operations in the United Kingdom, Austria, Belgium, France, Germany, Ireland, the Netherlands and Portugal will change hands in the deal. The sale follows a strategic review of the business, with Unilever looking to concentrate on faster-growing sectors. 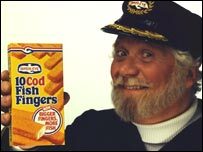 Birds Eye first launched its famous fish fingers in 1955. Unilever's ice-cream business is not being sold. The deal, subject to regulatory approval and consultations with unions in the countries affected, is expected to conclude by the end of the year. The businesses being sold - which also include Findus and Iglo - produced total sales worth £836m last year, making profits of £117m. Clarence Birdseye was a biologist for the US government. He set up his own company - Birdseye Seafoods - in 1922, which patented quick freezing. It employs about 3,500 people across Europe, with about 1,300 staff working in the UK at locations in Suffolk and East Yorkshire. Despite remaining highly profitable, the business has been hit by consumers' increasing preference for fresh food. Unilever said that although the business was home to "iconic brands" it thought it was in its best interest to have a new owner. "Having taken the decision to focus our portfolio on other priorities, I am confident that the business will prosper under the dedicated and focused management that Permira will bring," Patrick Cescau, Unilever's group chief executive. Permira owns the AA and the Gala Coral Group and recently agreed to sell hotel business Travelodge to a Dubai-based firm. "The market sees few food deals of this size and very rarely involving brands of this stature," said Cheryl Potter, a Permira partner.